Do you remember last year when Hatchimals came out and they were the talk of the town? I do and I was so sad when my daughter didn’t end up getting one, they looked like a lot of fun. This year Hatchimals came out with a new product called Colleegtibles. The collectible toys seem to be a big hit recently and these ones have their own fun twist. Check out why they have been such a hit in our house and are going to be at the top of my daughter’s Christmas list below! *I received the products pictured below in exchange for my honest opinion of the product. 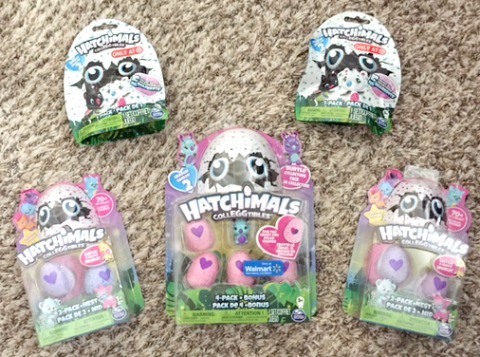 Hatchimals Colleggtibles come in three different packs. They come in a one pack, two pack or four pack. The one pack comes with one colleggtible, the two pack comes with a pink nest and the four pack comes with an extra colleggtible. The Colleggtibles are so easy to hatch. Pictured above is the Colleggtible egg. The eggs come in different colors depending on where the Hatchimal is from. To hatch the egg you apply heat to the heart by rubbing it, we found this was easiest with your thumb. When it is ready to hatch the heart will turn pink. Then you press in on the heart and the shell will start to break. You will then find your Hatchimal. Like other collectible collections one of the fun parts is the surprise of who you will get. My daughter ended up getting two of the Hatchimals she was hoping for. Watch us open one of our Colleggtibles in the video below! The Hatchimals are all adorable and lovable. My daughter has been carrying her Hatchimals around with her non stop since she hatched them. Something we learned about them while playing was that they have two holes on their back which is perfect to add them to a necklace. This makes it even easier for it not to get misplaced somewhere. 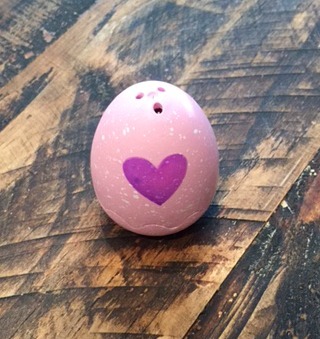 Another great place to keep your Hatchimal is in the bottom of the egg. We didn’t learn this until we had already thrown our egg shells away but if you pull off the shell to the wavy line it becomes a bed for the Hatchimal. One more fun feature of these fun Hatchimals is that they all come with glittery wings. We love glitter in our house so this was a fun surprise! The Colleggtibles will also not break the bank! They are very reasonably priced and would make for great stocking stuffers this Christmas! Who do you know that would love to receive Hatchimal Colleggtibles for Christmas this year? What is your favorite feature of this fun product? Let us know in the comments below! Its so cute and adorable! Right? 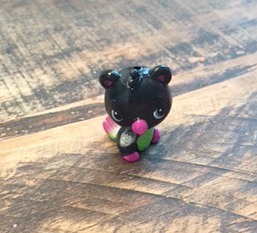 They are one of the cutest collectible toys I have seen yet!